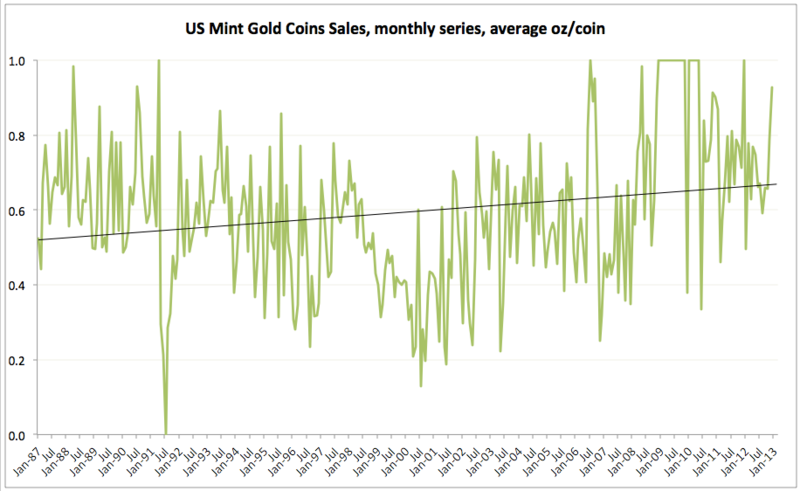 In the previous post, I looked at the annual data for US Mint gold coins sales. Here, let’s take a quick look at the shorter-term, monthly trends and dynamics for December 2012. Following a robust monthly rise in sales of coins by oz (weight) totals to 136,500 oz in November, December sales moderated to 76,000 oz (down 44.32% m/m), still posting a healthy 16.92% increase y/y. Compared to historical average of 56,346 oz the sales are still up, although December 2012 is below 87,717 oz average sales for the crisis period (since January 2008). However, while difference to historical (1987-2012) average is significant statistically, it is not significant relative to crisis period average. Furthermore, 6mo MA is at 68,250 which is well below the December sales levels. For those thinking of a ‘big fall-off in sales’, December 2012 marked the highest volume (by weight) of sales since December 2009 and the fourth highest volume since January 2000. In terms of number of coins sold, December 2012 came in at 82,000, or 52.74% down on November robust sales of 173,500, but monthly sales were up 26.15% y/y. Compared to historical averages, December 2012 sales are statistically indifferent from historical average sales of 98,758 coins per month, and from crisis-period average of 119,642. 6mo MA sales are at 93,500, ahead of December sales, while H1 2012 average sales were at 93,750, also well ahead of December 2012 volumes. 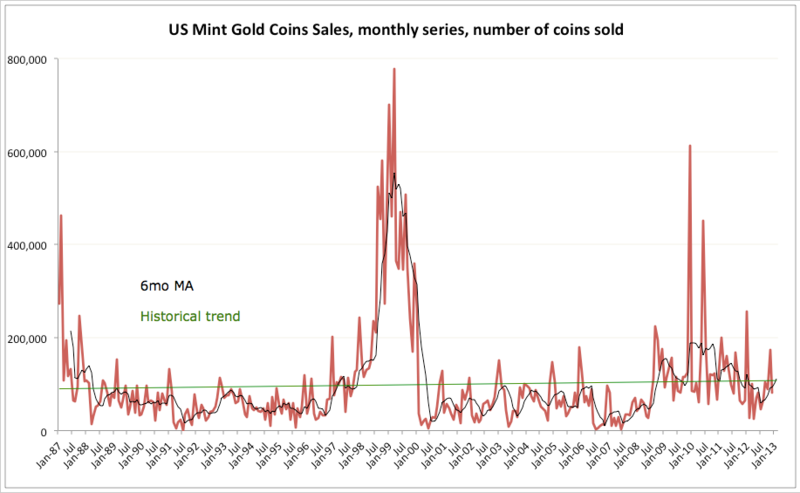 The relative moderation in the number of coins sold compared to the trends in the volume of coinage gold sold (oz) can be explained by the increased oz content of average coin sold. In terms of oz/coin sold, December 2012 sales stood at 0.927, well ahead of 0.787 in November, posting the highest gold content reading for any month since December 2011. Historical average content is at 0.590 oz/coin and crisis period at 0.790 oz/coin, both statistically significantly lower than December 2012 figure. As above clearly shows, the historical trend is upward sloping and the current reading is comfortably at the trend levels both in terms of 6mo MA and actual level reading for December 2012. 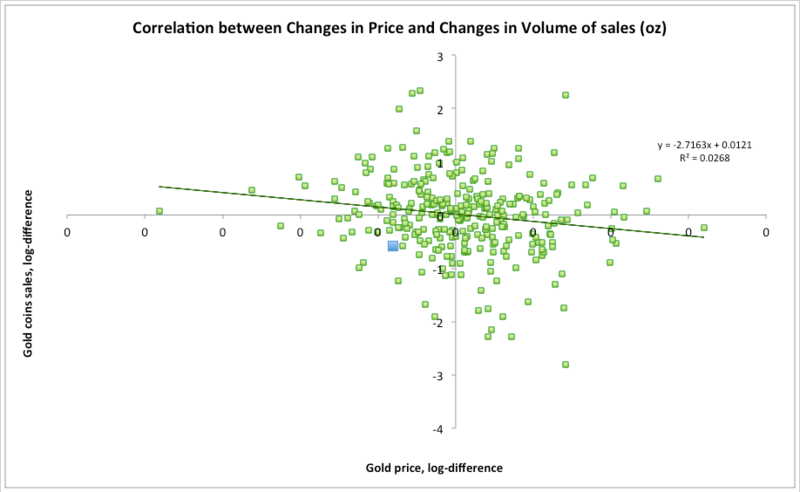 A little more statistical ‘beef’ on these: 12mo dynamic correlation between gold prices and total gold sales via coins (total oz weight of sales) rose to +0.34 in December from +0.28 in November 2012, so declined prices (y/y) have been associated with some increase in demand. Recall that in November-December 2011, gold prices fell from $1,746 to $1,531, while in the same period 2012 they moderated from $1,726 to $1,657.50. 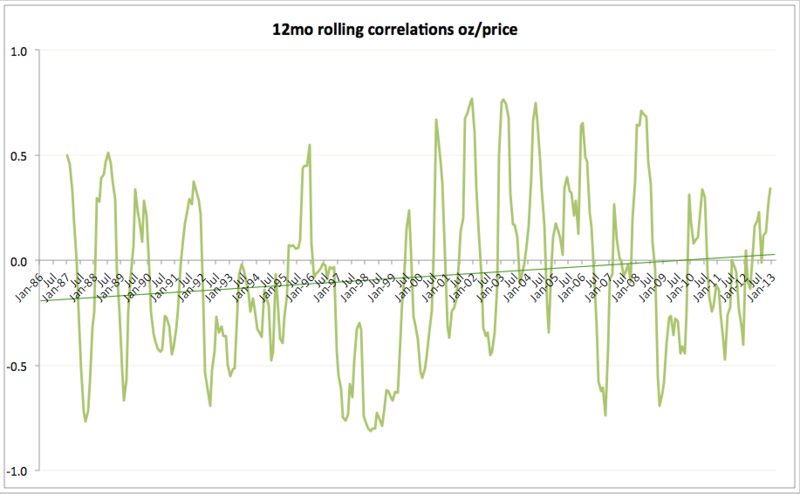 December marked 4th consecutive month of positive 12mo dynamic correlations. Historical 12mo dynamic correlation of +0.17. Looking at longer-range correlations, 24mo dynamic correlation in December 2012 stood at -0.23 against the historical average of -0.10 and up (in absolute terms) of -0.19 in November. As mentioned above, December 2012 sales were characterised by a substantial increase in average gold weight of coins sold which is running well ahead of the historical (upward sloping) trend. More significantly, this year sales fell below the historic trend in 6 months out of 12. Hence, neither trend direction, nor current deviation from the trend are indicative of any severe downward demand pressures. Overall, sales dynamics show that since February 2012, volumes of sales in oz have recovered nicely back to their historical trend (upward sloping) and are currently running above the January 2000-July 2008 averages. 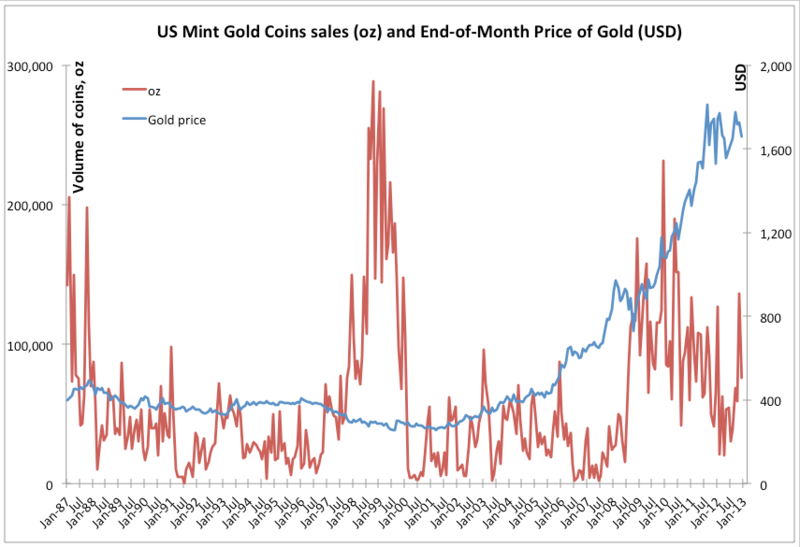 While December 2012 observation is to the downside of the trend, it is clear from the picture overall that changes in gold prices during a given month have statistically no discernable relation to the demand for gold via US Mint coins sales. This simply confirms the nature of fundamentals driving demand for coins as discussed in my previous posts on the issue (see previous post linked above for one such link).